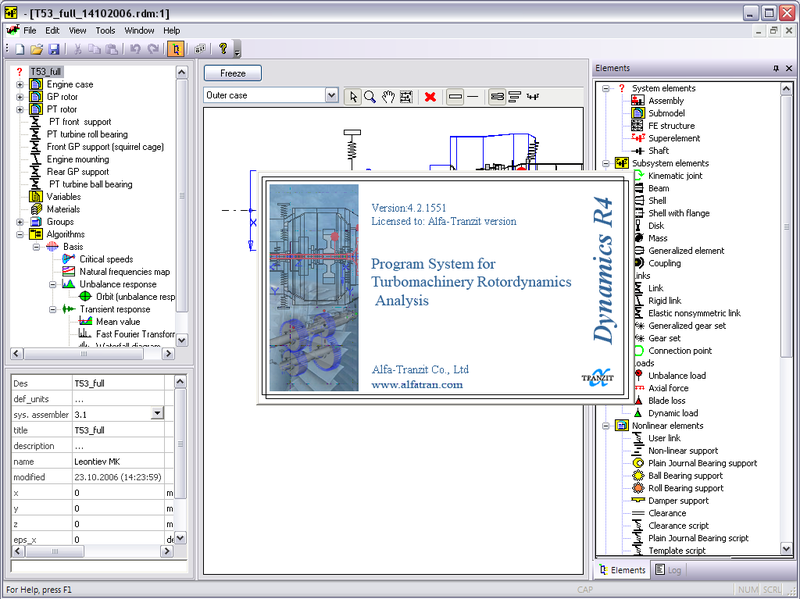 Development of software versions Dynamics R4, Alfa-Tranzit Co.
New element [Shaft misalignment] was added. The element models parallel and angular misalignments of the two coupled shafts rotating at the same speed. New visualisation option that truncate high frequencies was added to the natural frequency map algorithm. When enabled this option sets the maximum limit of the y-axis on the natural frequencies map plot equal to 1250f the maximum rotating speed. New command Create Group was added to the [Groups] context menu. Ctrl+G is the respective keyboard shortcut for this command. New button 'Create variable' was added to the matrix editing dialog. Using this button the user can create a new variable and attach it to the selected matrix cell. It is possible now to edit a variable attached to a certain cell of the stiffness, damping or flexibility matrix by double clicking on the name of the attached variable. 'Create new variable' command was added to the [Variables] context menu. The keyboard shortcut for this command is Ctrl+Shift+V. 'Create new variable' command was added to an element context menu. The keyboard shortcut for this command is Ctrl+Shift+V. Fixed: the variable editing dialog now can be openned via the double click on the name of the attached variable. It's also possible to reach this dialog via the "Extended properties" command from the variable context menu. The [Parametric Analysis] algorithm configuration dialog has changed: the column names have been added to the input variable properties table. A double click on a link in the 2D view of the model now shows the edit dialog of the link stiffness and damping matrices. The selection of the active elements in the 2D view of the model has been changed. Context-sensitive selection is now available when you press the Ctrl button. The behaviour when adding a new subsystem element into the model tree with no active subsystem element selected has been changed. If an element is selected in the tree and the user adds a Rotation Speed element to the model, the corresponding dialog box is supressed. New keyboard shortcut Ctrl+L creates a [Link] element in the active assembly. New keyboard shortcut Ctrl+Shift+L creates a new [Link] element requesting the parent assembly to be specified. New keyboard shortcut Shift+L creates a new [Elastic nonsymmetric link] element. The new command "Add link" has been added to the [Connection point] element context menu. If the element Connection Point is selected in the model tree when adding any link from the elements library the corresponding link will be created already having a connection to the selected Connection Point. Fixed: the assembly selection in the results filter of the algorithms [Unbalance response] and [Nonlinear Analysis] now does not reset to the initial value when switching to the model view and than back to the plot. Fixed: the software now does not crash when the user adds some new elements to the empty model and deletes them right after. A field that allows the user to specify path to the materials database was added. The program crash when a cell was selected in an empty table of the bearing data import dialog was fixed. The intermediate results of the basis calculation are now wiped out before starting the [Transient Response] calculation. Keeping the intermediate data used to result in stopping the calculation for some complex models and the use of the saved basis was necessary. Error "The value is out of range: Visibility 0 <= -1 <= 1 was fixed. The error appeared when changing the colour of the Assembly type structural element. The intermediate section insert procedure being invoked by double-clicking on the model has been fixed for the case if the active object is the point element. Previously, the duplication of the point element used to occur. The parameters filtering in the element "Mass" when 'Vis as: Disk->Blades Only-> Vis as file' option is selected was fixed. The workflow of adding a new section into the conical beam or the shell was fixed. Previously, in this case the geometry settings were reset and the element used to degenerate to a cylindrical beam one. New keyboard shortcut Ctrl + LMB (Ctrl + left mouse button) has been added. This action creates an element whose dimensions are retrieved from the current position of the cursor instead of dimensions of the previous element. The rendering of the arrows indicating the gravity centrers positions of the assemblies and the subsystems having an offset along z axis was fixed. New element [Beam bimet.] was added. Allows to adjust different material properties in the radial direction. New element [Beam MKD] was added. Allows to define different beam diameters for stiffness and mass-inertia properties. Issue with Unbalance Response calculation was fixed. Very high vibrations was simulated for systems with nonzero unbalance phase. Unbalance phase parameter was mixed with moment unbalance. Issue was only in 4.10.5.4810 version. Issue with nonlinear damper support calculation was fixed. The solution used to diverge for systems with long damper and pi-film. The elements transparency and color settings were amended. Menu colors transferred to a higher level. Fixed the reset color settings when converting beams into the shell, or vice versa. Fixed crash while multiple switching between mode-shapes in complex models with a large number of sections. Fixed a memory leak when using 3D display of the model when switching mode-shapes. Quick jump to referenced section in the link parameters with [via body] connection was fixed. Additional visualization was added for [DynamicLoad] element. In the [General], [Impulse], [Step] modes load is shown as an arrow in accordance with input values. In [Unbalance] mode load is shown as unbalance load. Function to insert additional section into the elements with length by double click is added. The command [Add to last group] was appended into context menu. Addition of point elements into the last used group. Problems with copying of subsystems with the connection points inside the model were fixed. Links connection had worked incorrectly. Problems with the model calculation after using the [Restart submodels] menu command were solved. Buttons for charts exporting into clipboard were added. Buttons for charts settings save and restore between program launches was added. Buttons for charts legend control were added. Information on simulation command script interface were added. Reference help system on script functions. Additional type [unbalance] was appended to Dynamic Load element. It’s allows to model nonsynchronous excitation by setting of unbalance load and rotation factor. (for example oil inside compressor drum). In addition to button “Separate all subsystems” new function for taking apart different assemblies was appended. Additional orthogonalization of multiple same modeshapes was added. The low orthogonality of calculated modeshapes had appeared in some spatial models. Width of the expanding box for the list of connection points was extended. Visualization of Natural Frequency Map, Stability Map was improved. In old versions there was black colored lines in maps with big amount of subsets. Functionality of saving to disk and loading from files was added to Materials Edit Data Base dialog. Output of Logarithmic Decrement and Damping Ratio was added to table view of selected modeshape (Natural Frequencies and Critical Speeds algorithms). Such output was added to Frequency Summary table in protocol. Progress bar of current calculation state was added to some algorithms(Natural Frequencies Map, Parametric Maps, Unbalance response, Transient response). Zero complex component was removed from table view of selected mode shape in Basis algorithm. Coping of Variables group and separate variables between assemblies and models was added. Appending Variables group from the elements and algorithms library was added. Coping of Materials group and separate materials between models was added. Algorithms coping between models were added. File name outputting of calculated model was added to log window. Allows to differentiate results in case of working with several models simultaneously. List of the one level parameters(simultaneous parameters changing) was added to axis’s labels in Parametric Maps. Unicode support was improved. It is possible now to output protocol for models with elements names in letters other than Latin and Cyrillic (for example Asian languages). Converting to English units is extended. System of model input validation was improved. Data output for frequency type was changed from rad/sec to cycles/min in Parametric Maps. The code includes new capabilities for 1-D and 2-D parametric studies by verifying the model parameters, speed, dimensions, location, stiffness, damping, load, etc. New steady and unsteady loads, unbalance, impact, harmonic, periodic, weight, axial load, etc.